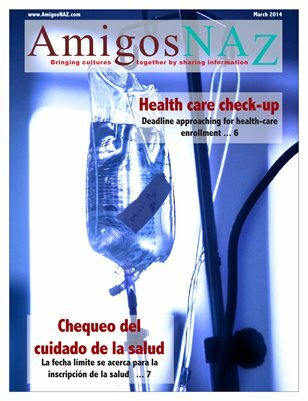 The March 2014 edition of AmigosNAZ opens with a cover story on health care including the March 31 deadline for enrollment in the Health Insurance Marketplace. The edition also includes local briefs on funding for the Rio de Flag Flood Control Project, the elimination due to budget cuts of the Coconino Community College Community and Corporate Learning Division and the appointment of a new Flagstaff Medical Center president and CEO; a commentary on upcoming César Chávez events, a commentary by the Coconino County Public Health Services District on the origins of public health; a commentary by David Parra of AARP Arizona on the Affordable Care Act; tips on how to have an enjoyable and safe spring break experience and a listing of upcoming events in the region. All this and more brought to you by AmigosNAZ — Providing information for and about the vibrant Latino community in Northern Arizona.